So if I had a time machine that allowed me to enter any era in baseball (I daydream about this fairly often), I would go back in time and watch Mickey Mantle in his prime at Yankee Stadium in the Bronx. But I feel like if there was a number two option, that guy I would want to pay a few bucks to see would be Willie Mays; likely in that 1965 season when he was 34 and wrecking things. I would take Mays ahead of Ruth, Teddy Ballgame, Stan Musial; you name it. Everyone except The Mick. The Giants won a ring that year by sweeping the Cleveland Indians in four games. 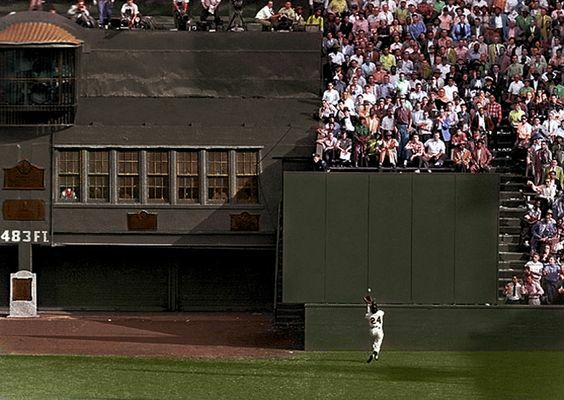 The catch took place in center at the hallowed grounds of the Polo Grounds. It was 483 to dead center there. It’s a place you should read more about, too.